So I owe you a few blogs from the last few weeks – it’s been a busy time! First up, a re-cap of Challenge Roth. 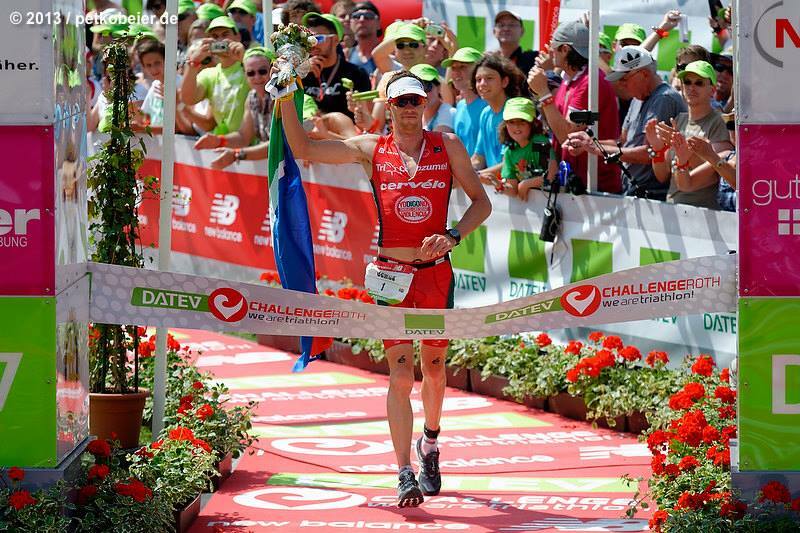 Challenge Roth was again a major focus for my season – as defending champ I very much wanted to have a good performance there against a quality field, and set myself up for a good second half of 2013. 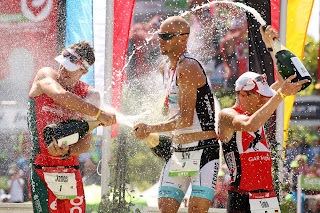 After a bike crash early in the year and a poor performance at Ironman South Africa, I felt I was back on track at Ironman Texas, but needed to prove to myself (and others) that 2012 was no fluke. I travelled up with Stephen Bayliss and was welcomed to my usual homestay – the von Hardenburg’s were, as always gracious hosts and I feel like part of the family as soon as I walk in the door. 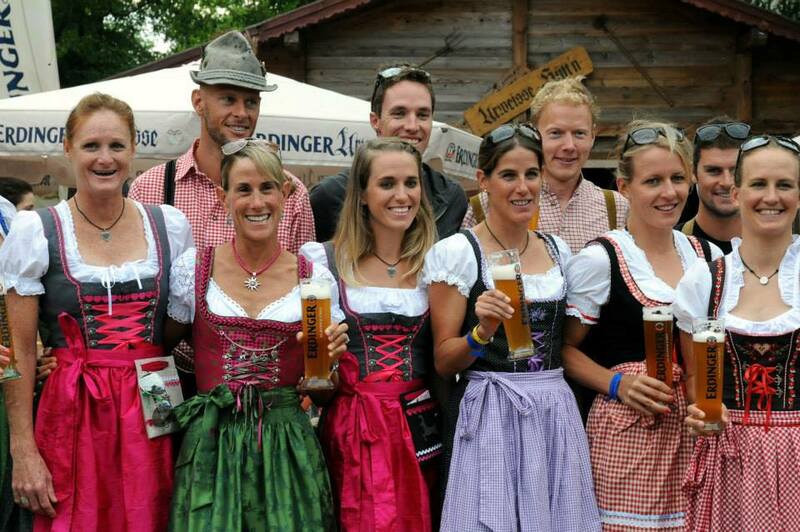 After the pre-race festivities, including the normal pasta party and less-normal (for me anyway) lederhosen, it was down to business for race day. I had a good swim – unlike last year the pack was broken up early by some strong swimmers, but I was able to stay with the ‘main pack’ with only a few guys up the road. One of those guys was Dirk Bockel, and halfway through the first lap, he was the only one still hanging out up front, about 2-3min ahead. Timo Bracht then flatted, and Konstantin Bachor took the pace up a notch (or three!). It wasn’t long before the chase pack was only 3 strong, and not much after that it was only Bachor, with myself and Markus Fachbach falling off his pace. Into T2 and out the other side Bachor was up the road (as he was in 2012) and Bockel was in front of him. Having had no splits for the second half of the bike, I was astonished to hear Bockel was a full 11mins in front of us. At my current fitness, a 4h23 bike split was all I had, especially with no real group for much of it, so I won’t beat myself up about that and simply bow to Bockel’s excellent 4h15 split. However, the race wasn’t over, and even 11mins can disappear quickly if the wheels fall off, so I set about putting myself in a position where if the wheels did fall off I could take advantage, and if they didn’t I would not have anyone behind me to worry about. I didn’t feel too great on the run and hit a few bad patches but was able to push through them all and get back to running. It’s not fun, but its good experience and lessons. As it turns out, Bockel was having the day of dreams, and his 11mins didn’t decrease to less than 10, and even went out to over 12mins at times. I would have had to run a 2h37 or so to have been near him at the finish and while I fully think I will run that one day, I didn’t have that today. I had to be happy with 2nd, and I am. It was a good move in the right direction. We were eating crabs. Actually its called crab picking. An apt name as you spend all your time picking at the thing for little morsels of crab meat. But it was fun and a good way to end my trip to Maryland thanks to the good people at TriColumbia. I’m pretty sure they get taught that line at school in Maryland though, cos every time I mentioned how little meat I got it was met with the same line, verbatim. We drove up to Maryland from Redtail Mountain Resort in Tennessee where I had spent two weeks recovering from Ironman Texas and training. Coach Robbie did a sterling job driving the B-Team van (it looks like the A-Team van from the movie – I pity the fool!) through torrential rain for nearly 10hours. It should have been 8hours, but our GPS took us on the scenic route through Washington DC, but we did get to see the Lincoln Memorial, the Washington Monument and Capitol Building, albeit glimpses through the traffic. The rain continued for 3 days and only cleared on race day. And it poured the day after too. Lucky. The race itself started in the Choptank river where there was a noticable current, which seemed to come from the bank somehow. It made for slow swim times but my swim was ok, if not great. Out on the bike with a 2:30 deficit to Andy Potts and 1:20 or so to Greg Bennet and co. The pace was furious for the first 30km and the group we were in was narrowed down to just myself, Victor Zymetsev and Jordan Jones. We kept the pace going the entire way and could hardly believe we hadn’t made up time on the leaders when we rolled into T2. But they must have ridden hard too. I was happy with how my legs performed 3 weeks post-Ironman and couldn’t have asked for more from them on this day. A 2:08 bike split was hard work when the course is totally flat – you couldn’t stop pedalling for a second! After negotiating the transition (due to the rain plus 2000+ athletes transition was a mudbath meaning a dis-mount and bike-on-shoulder cyclocross-style run), I was out on the run with still a 2:30 deficit and in 4th I knew I just had to go till I blow. It’s a risky strategy but sometimes it’s the only one. I went out hard and then hung on. I pulled back half the deficit to Andy Potts and 3rd and 2nd place in the first half of the run. But Andy came home hard and the 1min gap just seemed to hang there. I could see the pink shirt of the lead bicycle up the road, but just couldn’t close the gap. I kept pushing hoping to expose some crack in Andy’s game, but he was too good today. A 1:12 run split couldn’t bring him back and I had to be happy with 2nd. And I was. After all this was a fitness test – the best test of fitness is not always how fast you go, but how fast you recover and three weeks after IM Texas, I was apparently pretty well recovered. Big thanks to all my sponsors, and my homestay in Cambridge, the McCrays for making me feel right at home! Now I am in Leysin and once I am over the jetlag it will be head down training until Challenge Roth on 14 July. I am feeling better prepared at this point than I was last year, so am confident I can defend my title. Wearing number 1 will be added motivation! My day started better than I hoped. Not only was I able to stay with the lead pack in the swim, but the lead pack put some serious time into the chasers. All the hard work in the pool with Jodie is paying off. More improvements to come, but on the right track. Being a non-wetsuit swim makes it even more rewarding, and a big thanks to HUUB, who went out of their way to get me a swimskin to race in in time. Out onto the bike and team-mate Mathias didn’t waste any time showing his intentions. I toyed with the idea of going with him, but at this stage of my season that was not the game plan, and it was too early in the day to throw the game plan out the window. So settled into a rhythm and let the race settle into its packs of players and pretenders. As usual with Ironman, distinguishing these is nearly impossible until much later in the day. I soon found myself in the main group of 7-8 guys, with only Mathias up the road. Cervelo P5′s were everywhere it seemed. Simply faster. I got no information on the race situation whatsoever – it’s one thing not knowing what’s going on when you’re following bad coverage online… it’s worse when you’re in it and are clueless! Towards the end of the bike I still felt good and pushed on closing the 5min gap significantly to Mathias, but it turns out a second group was not far behind us by then which I was unaware of, so onto the run it was a close race. Again, and given the extreme heat, I decided it was still too early to throw out the game plan, so stuck to it despite being passed by three guys putting me into 4th. Paul Amey, Justin Daerr and Ian Mikelson were now in front of me, but they were playing a dangerous game in heat that extreme. I concentrated on drinking (lots), cooling, getting some Red Bull into me to finish strong. And did exactly that. But after running into 2nd in the final 5miles, I ran out of real estate to catch Amey who put in a really solid performance for a well-earned first IM title. When you can execute your race plan flawlessly in an Ironman and put your best effort out there then you’ve had a great day, so this will go down as one of my fond memories, even without the win. Thank you to all my great sponsors of course and the Plants for my great homestay! The new teamTBB division - Jodie has now joined me on this team! After heading home following Ironman Cozumel in November 2012, and getting the dreaded man-flu on the trip, I was back into training and my form was coming nicely for the 20 January race in East London. On Christmas eve, I was indecisive about heading out on the bike – it was about the only wet day we have had in Stellenbosch since our return. I decide to ‘man-up’ and get out there. It was to be a fateful decision. As I was coming back through town going through the last intersection before home, one motorist doing an illegal U-turn blocked the view of a second motorist turning in front of me. A swerve, a lost front wheel, and a long slide on my hip and back. The guilty party doing the U-turn blissfully unaware of the consequences of his actions. I was picked up and dusted off by concerned Stellenbosch citizens and given a lift home. The P5 was unharmed and besides a good ‘roastie’ and bruise on my hip and some road rash, so was I. The only casualty was my bike shorts – they would not recover from their injuries and were laid to rest. Fast-forward a week and I was swimming, biking and running pain free, except the hip roastie which insisted on sticking to any clothes I wore. I was back on track for 70.3. Then my back spasmed, my hips went out and I developed ITB pain on the opposite leg. Running was impossible. Fast forward 2 more weeks and I am still not running. It seems my entire body was in revolt. Everything was too tight. Multiple visits to Lawrence van Lingen (@lorenzomojo) and every time we made big progress releasing the offending tightness, but every time the pain was still there when I ran again. Perhaps I am jinxed and a win on home soil is destined to elude me forever… but I doubt it. It may elude me this weekend in East London once again, but I look forward to laying those thoughts to rest in Port Elizabeth in April. Best of luck to everyone racing Ironman 70.3 this weekend, especially the first timers – and especially especially my Mom and sister! I’ll see you all in East London. Come say Hi! 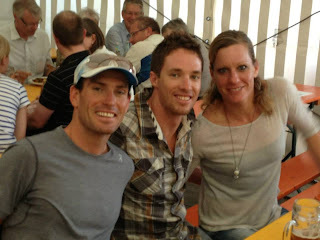 Jodie and I had planned to go to ITU Long Distance World Champs for a while and on the back of Roth I was feeling pretty confident. I needed to get a Visa for the UK so had sent my passport off to the visa office… and it simply failed to return. So 24hrs before we were supposed to fly to Spain, we had to change plans: rent a car and drive. You cannot fly into Spain without a passport, but there are no border checks if you drive. Go figure. So we made the 11hr drive through France and it was actually pretty painless and fun. Vitoria-Gastez was a cool town, with lots of picturesque scenes everywhere you look. Unfortunately the scenery was all I took from that race. I swam into a tangle of sea-weed (lake weed?) in the first 100m and lost the pack, which over the next 3900m translated into about a 3min deficit. The lead Spanish guys were in no mood to hang around so that was pretty much my race. I went really hard – too hard to maintain for 120km; it was make it up to them, or die trying. …I did the latter. On the run I had nothing left and after 2 laps I pulled the plug. Jodie hung on for Bronze in the ladies race to keep the ball rolling on her return to form, so the trip was not a complete loss. We headed back to Leysin, and then off to London (my Visa had arrived with plenty of time to spare – I picked it up on the way to the airport!) to see Jodie’s parents and some of the Olympic spectacle. I had never been to the UK so it was good to finally see the place. We kept the training up while there, despite the rain, although swimming was an issue – the UK has pools everywhere, but most of the time they are given over to ‘tea-bags’ who float up and down – it is obviously more important to keep the 60-80yr-olds fit than it is to get the 6-18yr-olds off the couch and doing laps in the pool. Obviously. We did have tickets for the Women’s triathlon. They turned out to be the best seats in the house and we had a perfect view of Nicola’s perfect race. Well, Doc has since said it was anything but perfect, but hey, when you leave with a Gold medal you can’t do much better! It was great to be there and share her once-in-a-lifetime experience. I didn’t actually see Nicola until 2 days later and then it was for only 3mins as she rushed from interview to interview to Federer’s Gold-medal match – lifestyles of the rich and famous, huh? We also had tickets for one evening at the athletics. It was good to experience the stadium and the Olympic park, although the tickets were costly and the evening we got was not so special – rain and a dodgy winner in the 1500m ending the evening with a bit of a ‘hmmmm’. We also spent some time at the Oakley Safehouse, which was a great hangout to put the feet up in the madness of it all, with a steady stream of medallists coming in and out. Jodie headed off to Wiesbaden for 70.3 after London and I headed to Leysin to get back into some solid training. It was good to put some solid training weeks together and I could feel my bounce and fitness returning. I still love Leysin for training and now after my 4th summer there it feels like home away from home. Having hit some good numbers in training and feeling confident and strong I headed to Gerardmer Triathlon in France. It was my last weekend in Europe (visa expired) and I was looking forward to ending the summer on a high. Unfortunately the European weather gods had decided summer had already ended, so race day dawned rainy and about 5C. The boss’s orders were pretty clear – don’t be a hero on the bike, no sense risking the rest of the season on treacherous roads for one race. Given that I was so cold I couldn’t get going uphill and my serious caution downhill, I was way down by mid-way through the bike (about 22nd I think). It warmed up a bit, as did I, on the final lap of the bike and I got moving on the run to get myself up to 5th by the finish line. Not what I was hoping for, but all things considered… I didn’t crash. End of story. Jodie had a good swim and most of her ride was good, but the heat and dehydration caught up with her and she faded on the run. She left there less than happy, but motivated and still building her world-beating fitness day by day. So now we find ourselves on the tropical Mexican island of Cozumel. We are racing the 70.3 this weekend here on the island and it promises to be hot and humid. But 30C, even with 80% humidity, is more bearable than 40C and we are both looking forward to the race. With good points and prize money it promises to be tough competition too, so all in all a day to look forward to. Two years ago I was forced to withdraw from Ironman Austria the evening before the race with illness. And so, a quick call and two weeks later I took that fitness to Challenge Roth. I was blown away by the race. I already knew all about it and it’s history, but it really is a special event. I met and became friends with Felix, Kathrin and the Challenge Family. That year I came 6th, and I was stoked! Two years later that 6th place seems like a lifetime ago. In the interim I have had some great success, but also some bad disappointments - I was forced to withdraw from Roth in 2011, and then dealt with a bad injury which sidelined me for the better part of the last year. And it was on this backdrop that I entered Challenge Roth 2012. I got smashed by over-enthusiastic sub-9er AGer’s and tangled in the start rope of the swim. I swam hard to overcome this. I got tangled in the same rope going back the other way up the canal as they lifted it one side for a wave start and dropped it on me. I got out the water and was surprised to see all the top guys around me. I didn’t know it then (no watch) but I swam 47mins. That’s a swim PB. By a lot! The first lap on the bike Timo Bracht and myself traded off the lead spot, while Konstantin Bachor sped off up the road and we slowly shed the large group of guys behind us. The second lap was just a group of 6 – Stephen Bayliss, Mike Aigroz, Georg Potrebisch, Cam Brown, Timo and myself. As we dismounted Timo, Mike and myself had put some time in the other three in the final km’s and took off running. Well, Timo took off while Mike and myself slowly found our rhythm. After 3km Timo was back with me and suddenly Sutto popped out of the bushes. I can’t say I was surprised, but it was good to have him there. His only advice was to tell me to stay with him. I gave him a thumbs-up. No prob, that was already the plan. We stayed together at a steady clip of around 3:40-3:45/km for 18km, when Timo faltered and lost some time. Around 24km I caught Bachor for the lead. Sutto popped up again then, to berate me for attacking too early. 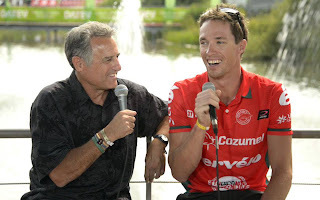 I just smiled and gave him another thumbs-up – I hadn’t attacked and we could straighten out what had actually happened afterwards; for now I was winning one of the most iconic races in triathlon. And that was about it for the drama of the day (until those final 4secs, of course!). I came in with a run time of 2h40:06. Also a big PB, and of course the PB of sub-8hrs too. I wouldn’t go so far as to say it was an easy day – I was hurting a lot of the time, and badly at times, but the memory of pain is short at best, and seems to be made far shorter when you win! This race will most certainly go down in my memory (and my autobiography one day) as a very special memory. And a very big breakthrough. Big thanks to everyone who played any part in making this dream come true. You know who you all are and there are far too many to thank here but especially Brett Sutton, TeamTBB, Alex and all our sponsors. Jodie, my parents and all the close friends who support and encourage me. And Lawrence van Lingen again, for magic hands helping get me back on track this year. And to my homestay in Roth, Cornelia, Rudi and Benni – thank you for making me feel at home in your home. See you next year! Cervelo P5 in action – a big day for it – 3 wins in one day! Amazing crowd support to share it all with. This will be my third time racing this amazing event and it has become one of my favourite races. The atmosphere and energy of the race is incomparable to any other race. Just this one hill (pictured), the Solarerberg makes the entire day worth it! I was 6th two years ago, and was forced to withdraw last year so I have some unfinished business at the event. It was also the last full-distance triathlon I competed in, having spent the year since I raced there last dealing with injury, so it almost feels as if I am picking up where I left off a year ago. But only in a racing sense – in a confidence, preparation and fitness sense I feel better than ever! As always, the race has a strong field, and it will take a fast time to win. But my training in Leysin has gone really well and I am looking forward to testing out my fitness at this great race. It is also the European Long Distance Champs – which I can’t win, being non-European (although in SA my ethnicity is ‘European’ – go figure) which will add to the events’ competitiveness. Steven and I will be making a road-trip of it from Leysin so it should be a fun weekend, with the added bonus of a race thrown in! So I am back to Leysin. This is my fourth summer here now and every year it gets a little easier to adapt and find my feet. Even now my first ride up The Hill was a bit of a shock to the system. I knew what I was in for – in fact I know pretty much every bump and pothole on the entire hill by now – but somehow that doesn’t make that first trip of the summer to the top any easier. Regardless, the first trip up The Hill and all its associated pain and discomfort is soon eclipsed by a ride up The Hill following a track session. Then you get a real reminder of what summers in Leysin are all about – especially if the track session didn’t go well and you feel like dying before you start! …Or for that matter if the track session did go really well… and you feel like dying before you start! …And we’ve only got through the first two weeks of an entire summer here! Bienvenue à Leysin! I lost this race in the final few miles. It is a frustrating thing, to be that close and then lose. Of course you immediately look back at what cost you 14 secs. Sometimes it obvious, sometimes not so much. This time it really was – I dropped my chain going up a hill 30miles into the bike. It only cost me about 30secs (maybe less – its hard to judge when your adrenalin is pumping!) but it meant a hard 15-20km to catch the leaders again. Of course, things like that happen in races. And if you win you think nothing of them. But races are never just about going through the motions and getting to the finish line as fast as possible. Mostly they are about overcoming obstacles, and getting to the finish line as fast as possible whilst doing so. But they say you learn more from your losses and there are plenty of lessons out of this one. Perhaps the biggest was the re-enforcement of the lesson learned at Wildflower a few weeks earlier – numbers in training mean little on race day. In Wildflower I had absolutely no training numbers to rely on before the race, and the race went well. This time I had one track session with Scott in New Jersey which went well, but that was about it – it certainly wasn’t smooth sailing since Wildflower. (On that note, a big thanks must go to Lawrence van Lingen. He’s my chiro in SA, and spent many hours on the internet and skype treating my knee from 10000km away whilst I was in New Jersey! Above and beyond.) That was a good lesson, and good for the confidence too. Winning would probably have been a better confidence booster, but we don’t want to be over-confident, do we? Next up is Challenge Roth on 8 July. Last year was a bad result (withdrawing on the run whilst in 3rd, due to injury) so I will be looking to put those demons to rest. Decisively. Right now, it is good to be back in Leysin, and with Doc – it has been a good 9 months since I had his beady eye watching my every move and giving me a general hard time… and I think I strangley missed it. I am not sure which is worse – telling everyone you’re gonna win a race, only to have your body make a liar of you… or telling everyone you’re in bad shape, only to have your body make a liar of you! Actually, that one is pretty easy – I was pleasantly surprised by my performance at the Avia Wildflower Tri in California this weekend. And it is a good feeling. I am not sure my fellow Pro’s appreciated the surprise, but I can assure them I was not playing mind-games and was as surprised as anyone that my body had the power it it had, and kept going as long as it did! 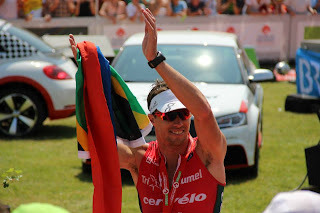 I came into the race off 6 weeks of dealing with injury niggles which put me out of Ironman SA and meant I had done almost none of the normal training I would do in the lead-up to a race like Wildflower. Add the that the fact that I flew literally half-way around the world 48hrs before the race, and I was standing on the start line just hoping to keep going for the full distance. But you can keep fitness with very little maintenance training, and muscle memory is a wonderful thing! I exited the water a little down on where I wanted to be, but I know where I went wrong, and overall was happy with my swim. Onto the bike and I knew the top guys were not too far up the road. But I was not sure I could bridge that gap without blowing up. I rode hard, but tried to stay in control for the first half. My legs just felt better and better though and when I noticed that I had inadvertently dropped Dan Hugo and Chris Legh I knew I must be riding well. I kept the pressure up and soon the top guys were in sight. The tough run course was where I had predicted my form would fail me though, so even after a good ride I wasn’t exactly brimming with confidence. I decided it would have to be a steady-state run, with no surges or racing – if I caught guys, great. If not, so be it. Starting the run in 5th I was already happy with where I was. Two of the guys ahead did come back to me on the tough course though (although it took some digging deep up the final climb to reel in Paul Matthews) and I finished in the same place as last year, 3rd. The result bodes well for my return to form and the racing season ahead so I am, for the first time in months, excited about upcoming races and what they hold. A big thanks to everyone who has helped in the last few months of struggle, and to all my sponsors for their continued support, especially teamTBB, Cervelo, Campagnolo, 2XU, 3T and Cobb Saddles. And of course to my biggest fan, Jodie. She is probably the only one who has seen all the recent lows and can appreciate the high I am now on!